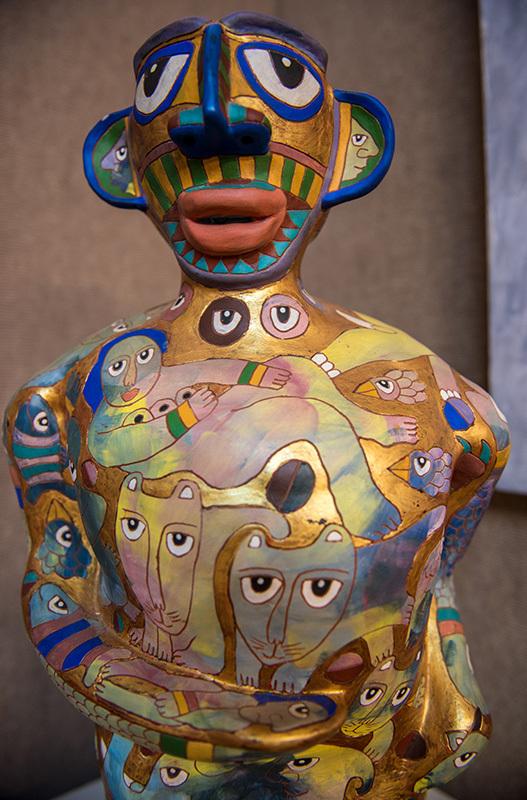 Ceramicist Washington Ledesma passes along his skills in latest exhibit. 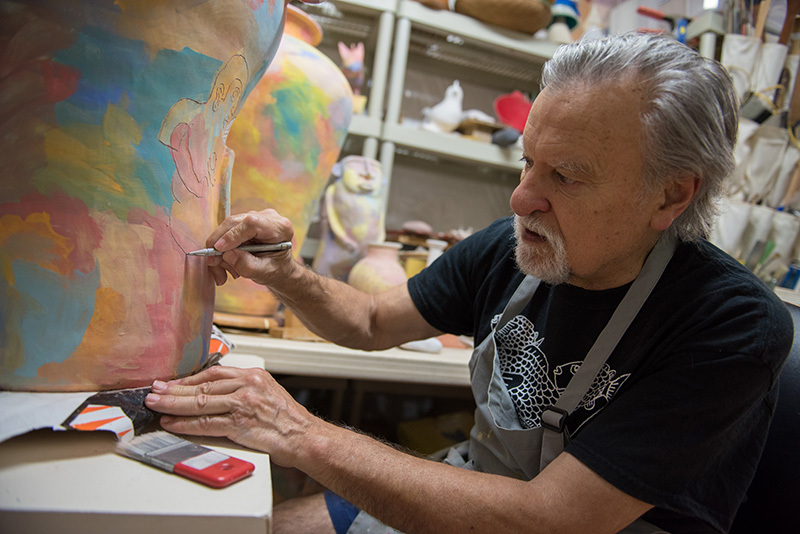 Vineyard ceramicist Washington Ledesma and Donald O’Shaughnessy will exhibit a joint ceramics show on Friday, July 13, Saturday, July 14, and Sunday, July 15. 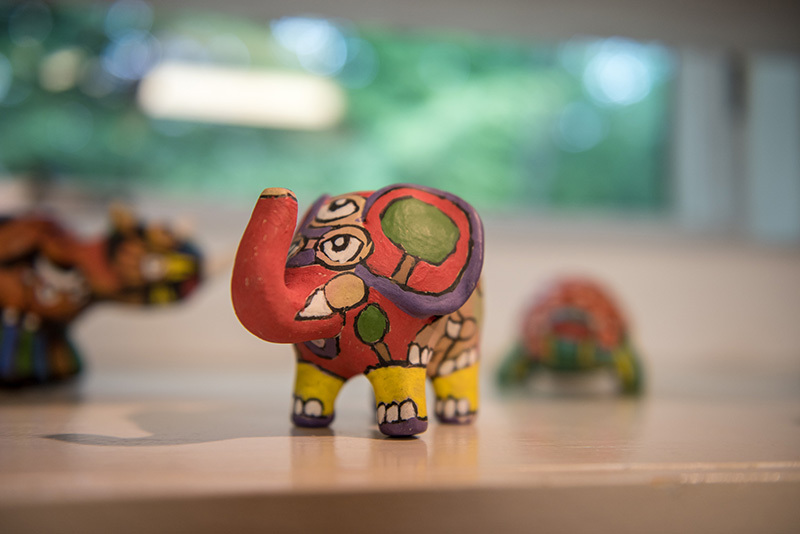 The art display will be held at the Washington Ledesma Gallery in Oak Bluffs. 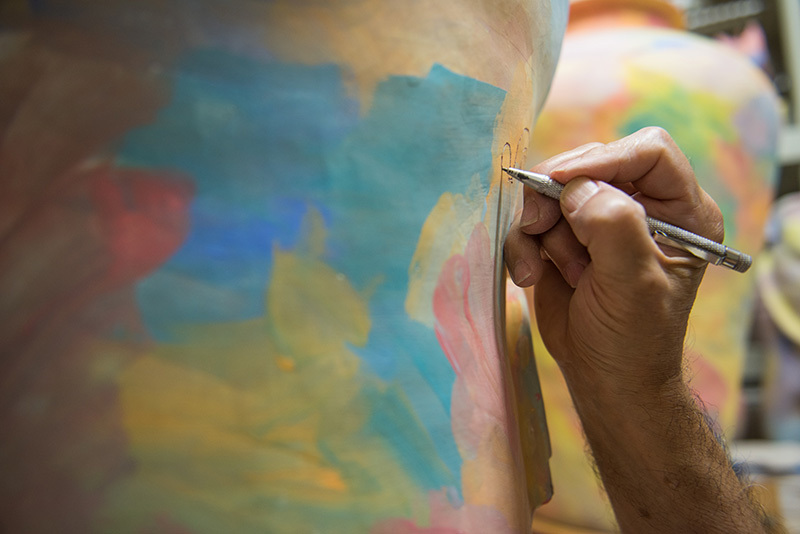 Ledesma, originally from Uruguay, is well known on-Island for his colorfully painted and glazed ceramics. Nineteen-year-old Islander O’Shaughnessy is the grandson of Ledesma’s partner, the photographer Alida O’Laughlin, and has been throwing pots for five years. 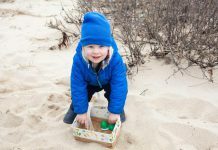 A graduate of Martha’s Vineyard Regional High School and a student at UMass Boston, O’Shaughnessy works on his pottery at home on weekends and during summers, since UMass Boston doesn’t have a ceramics department. 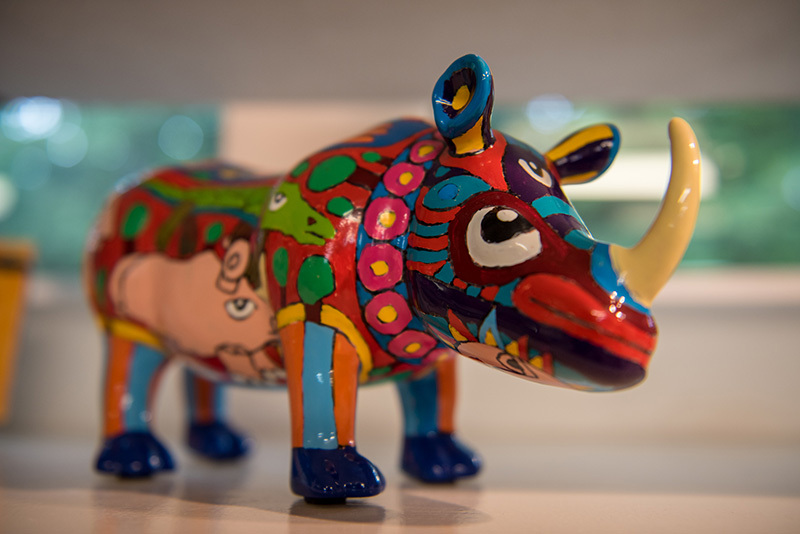 Ledesma’s unique style harks back to many ancient cultures. He has researched symbols from 50 different civilizations, including Mesopotamia, Africa, as well as Celtic, Mayan, and Incan regions. “My skill is in the drawing,” he said. It is something practiced by few potters, who instead concentrate on form. Ledesma is a master of form as well as painting. He uses five different techniques, relying on underglazes and then drawing on them. The result is fired only once. Color inspires the drawing, along with the action of the painting. 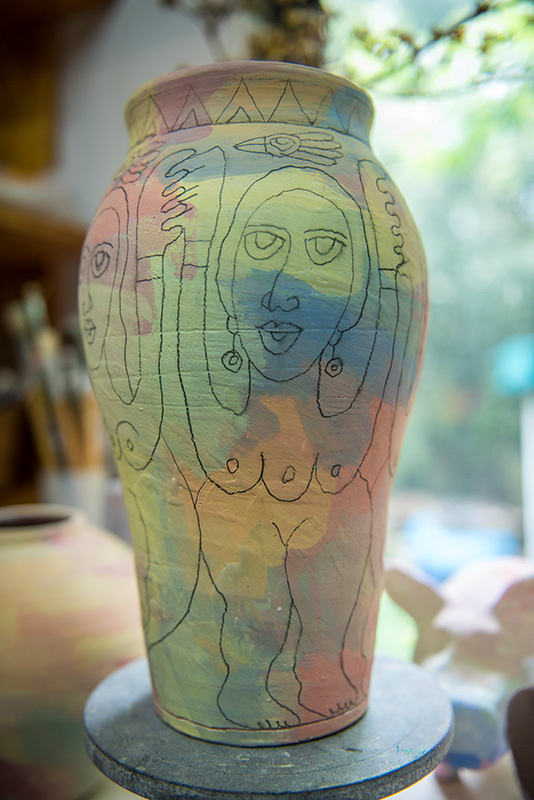 Ledesma uses both porcelain and white clay. Porcelain is a challenge to work with, and is the most expensive, he said. 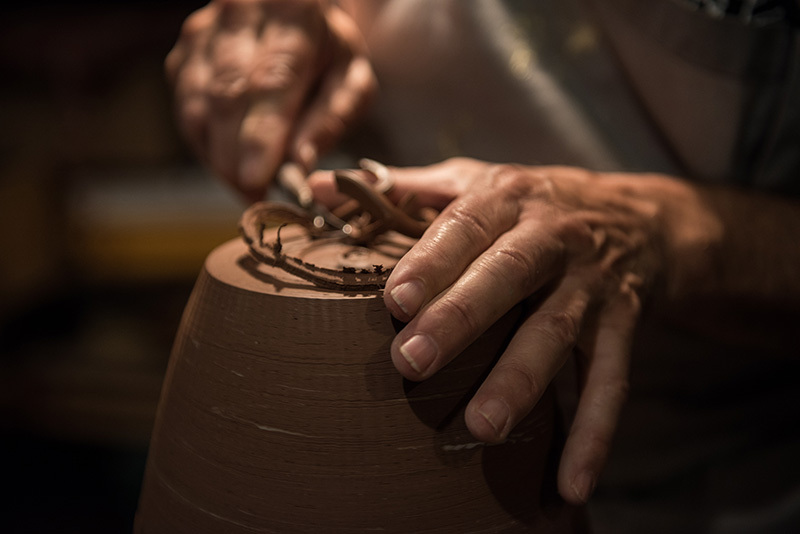 White clay is also expensive, and must be fired at a high temperature. 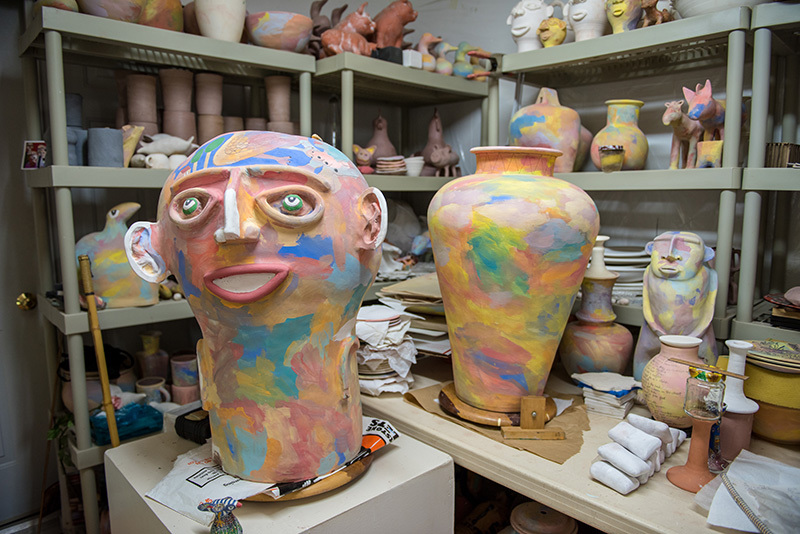 O’Shaughnessy is at the beginning of his career as a ceramicist, and has a flair for pulling up pots, according to his grandmother O’Laughlin. She describes the relationship between Ledesma and O’Shaughnessy as like grandfather and grandson. “Ledesma is a terrific teacher,” she said. Eyes play a prominent role in one of Ledesma’s works, “Flor de Lis.” It is a female figure covered with faces and animals in a palette that is more muted than much of the artist’s current work. One colorful lamp has a pot-shaped base covered with vibrant fish and what looks like an octopus. Other pieces are animal figures. 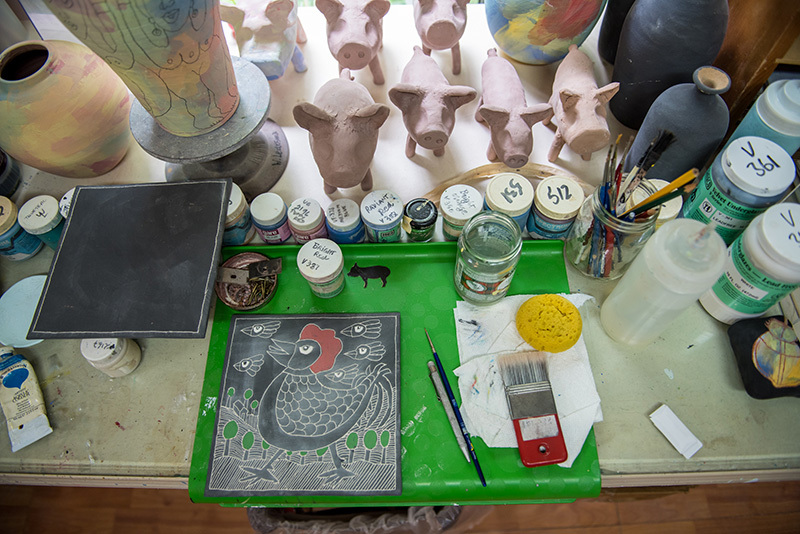 In addition to clay, he paints on glass, another three-dimensional surface for his work. One vase features a lively figure with flowers, leaves, and birds on a red background. In many of his works, the vivid painting is alive with activity. Another arresting work is a totem, topped by two heads with large ears. The artist will also demonstrate how he works during the show. “Donald is at the first stage,” O’Laughlin said of her grandson. 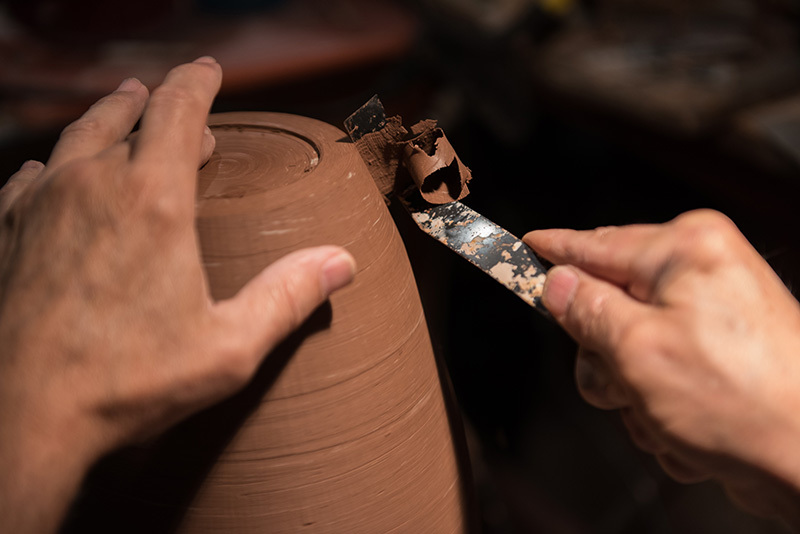 “He has a natural feel for his pots.” O’Shaughnessy may eventually move on to other aspects of pottery, including how thick or thin a piece is, how the clay is used, and architectural ceramics. Much of O’Shaughnessy’s work is traditional in form and pure in shape, with handsome glazes. 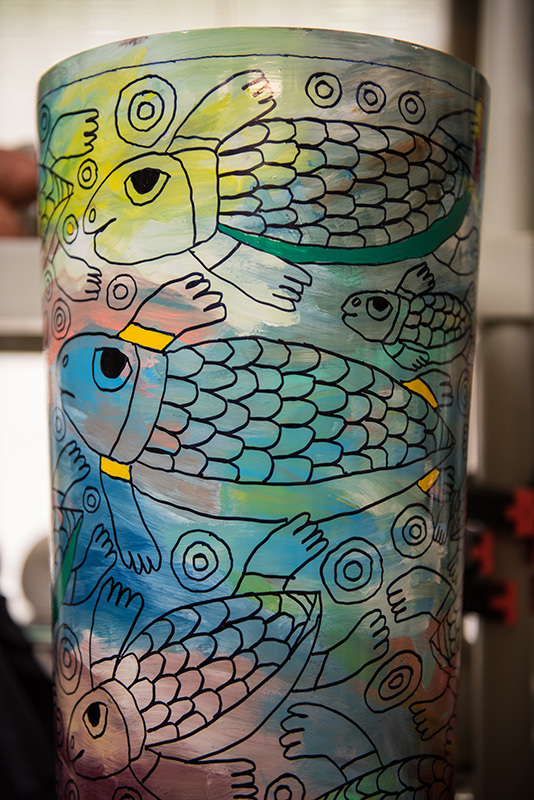 He makes cups as well as vases, and is already experimenting with colors and designs. 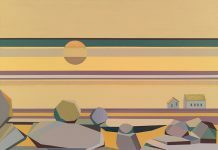 Washington Ledesma Gallery is located at 5 Murrant Ave in Oak Bluffs. For more information, call 508-693-1823.